Legacy gifts make up more than a third of AHO’s funding, and play a significant part in our ground-breaking advances in medical research. These gifts make long-term research and pioneering trials possible, leading to new tests, kinder treatments and cures which will help us beat diseases sooner. If you don’t yet have a Will, this advice can help you in the process of making one. If you already have a Will, you can find out how you could update it to include a gift to AHO. Over 55? 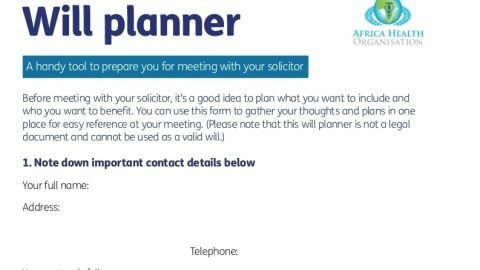 We’ve partnered with solicitors across the UK to provide a free Will-writing service for those wanting to write or update a simple Will. Every gift we receive helps bring forward the day when all diseases will be cured. Legacy gifts help us research drugs, discover what drives diseases such as cancer to grow, find new ways to detect cancer at an early stage when it is more likely to be successfully treated, and so much more. The people who leave us a legacy gift believe in a future free from the fear of diseases.